My guess is the eye has something to do with heroes being visible (with the red eye meaning the enemy team can see me), but I have no idea what the blue eye means. What does the eye actually indicate? Blue Eye: When you are in a bush and enemy team doesn't see you. 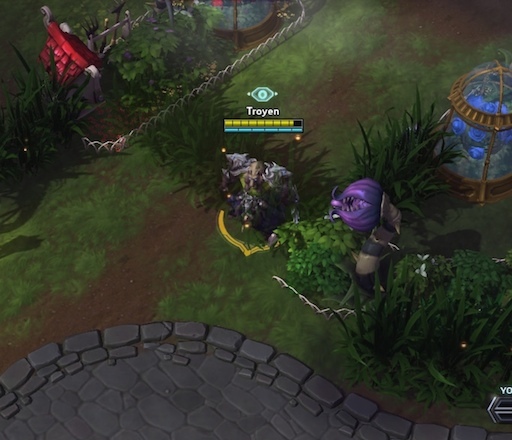 Red Eye: When you are in a bush or cloaked (Nova/Zeratul or Ally Tyrande's Shadowstalk) and enemy team sees you through abilities like Tyrande's Shadowstalk, Clairvoyance talent, Tassadar's Oracle or similar. Blue eye means that enemy team don't see you right now.